For other people named George Hunt, see George Hunt (disambiguation). 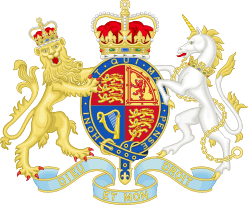 George Ward Hunt (30 July 1825 – 29 July 1877) was a British Conservative Party politician and statesman, Chancellor of the Exchequer and First Lord of the Admiralty in 1st and 2nd ministries of Benjamin Disraeli. He was born at Buckhurst in Berkshire, the only surviving son of a minister, Revd. George Hunt, and graduated from Christ Church, Oxford, in 1851, and 21 November of that year was called to the bar at the Inner Temple. 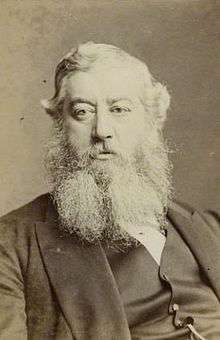 He finally entered the House of Commons in 1857 as Member of Parliament for Northamptonshire North, at the end of the year, having made several unsuccessful attempts previously. He was a Secretary to the Treasury from 1866 to 1868, in the ministry of the 14th Earl of Derby. He was then appointed to the Exchequer when Disraeli took office. By repute, when he presented his one and only Budget speech to parliament he discovered that he had left the ministerial "Red Box" containing it at home. This is said to be the start of the tradition that, when a Chancellor leaves for the House of Commons on Budget Day, he shows the assembled crowd the box by holding it aloft. 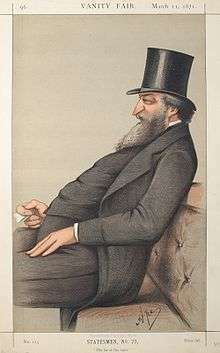 Hunt was appointed to the Admiralty for Disraeli's second ministry, serving from 1874 until his death from gout in 1877. Although he was considered competent at finance, his turn at the Admiralty was, for a long time, not much admired. Recently however, this attitude has shifted. Hunt married Alice, daughter of the Right Reverend Robert Eden, Bishop of Moray, Ross and Caithness, in 1857. They had at least ten children, one of whom, Sir Allen Thomas Hunt, became an Admiral in the Royal Navy. A very heavy-set person, Hunt is said to have been responsible for the semicircle that is cut out from the end of the table in the Admiralty Board Room. Canada's Ward Hunt Island was named after him. His residence was Wadenhoe House in Northamptonshire. He died at Bad Homburg, Germany, in July 1877, on the eve of his 52nd birthday. His wife died in 1894. ↑ Eric J. Grove, The Royal Navy since 1815, p. 57-59. Wikimedia Commons has media related to George Ward Hunt.